The Modular Cleaning Program (MCP) is both a database system and an approach for the cleaning of artworks. This system has been developed to assist conservators in their approach to cleaning with solvents, solvent gels or water-borne systems. While developed from the perspective of paintings conservation, the methodology is universal and applicable to any cleaning environment. The Modular Cleaning Program synthesizes established theory and materials in conservation practice into an organized schema. The Program is a new tool to make complicated chemistry accessible to the experienced conservator, allowing him or her to focus on the aesthetics of a sensitive cleaning and not be mired in either endless solution preparation nor limited by a narrow set of familiar cleaning solutions. The Modular Cleaning Program was developed by Chris Stavroudis, Paintings Conservator in Private Practice in Los Angeles with the cooperation and support of Professor Richard C. Wolbers, Winterthur / University of Delaware Art Conservation Program. The Modular Cleaning Program is an outgrowth of the long collaboration between Richard Wolbers and the Getty Conservation Institute, most recently manifested in the Gels Research Project. A final component of the Project was the discussion of a logic tree approach to selecting cleaning systems  intended to be an insight, as it were, into Professor Wolbers thought process when selecting a cleaning system. The nascent system was modified by Chris Stavroudis and built into a FileMaker Pro® database system. The Modular Cleaning Program is offered as both a practical tool and an opportunity to integrate the theoretical and material properties into our daily conservation practice. This newest version of the Modular Cleaning Program supports aqueous, solvent and solvent gel based cleaning systems. The aqueous cleaning system can be used in the simple mode (as in the earlier versions of the MCP) or in a complex mode where the conductivity of the cleaning solution is controled. The solvent system is not intended as an aid in cleaning, but functions as a visual proof of concept of how solvents can be mixed in the program. The solvent gel system allows formulation of a number of stock gels that can be mixed together to form a solvent gel with any intermediate composition. The Modular Cleaning Program database consists of 19 interrelated tables. The main database is the "Modular Cleaning Program" itself which combines components from the solutions database. The "solutions" database formulates concentrates and diluted solutions built from ingredients in the "components" database. The "solution sets" database builds the various solutions into sets for specific cleaning goals. The azeotropes database lists various published binary and ternary azeotropes found between solvents in the components database. To make sense of the system, the conservator should be familiar with the work of Professor Richard Wolbers and be comfortable with concepts like pH, ionic strength, HLB, cmc, and the functions of buffers, surfactants and chelators in aqueous cleaning. In the domain of solvents and solvent gels; solubility theory, aromaticity, dispersion forces, dipolar forces and hydrogen bonding should be well understood. The Modular Cleaning Program and the use of concentrated stock solutions allows for the conservator to test a large range of aqueous mixtures in a short period of time. By testing far more cleaning options than one normally has the time to mix and test, we hope that treatments can continue to move toward more delicate and sensitive cleanings. Likewise, by testing using the family of solvent gels, many different proportions of solvents in a Carbopol-based gel can be tested. The Modular Cleaning Program requires FileMaker® Pro. If you do not own FileMaker® Pro, you may download the appropriate runtime version for your computer system. The runtime package contains all of the database files plus a limited version of FileMaker® Pro 9.0 which allows you full use of the database (including creating component entries, and building your own solutions and solution sets), but does not allow you to create your own unrelated databases, or to edit or modify the database layouts or field definitions in the Modular Cleaning Program. If you use an Apple® Macintosh system or a Windows computer and own FileMaker® Pro (version 8.5, 9, or 10), download this version of the Modular Cleaning Program. After downloading the appropriate file onto your computer, UnZip the archive onto your hard drive. You should find a folder/directory titled "Modular Cleaning Program" which contains the necessary files. For FileMaker® Pro users, start the program, double click on the file "Modular Cleaning Program.fp7". Runtime version users should double click on the file "Modular Cleaning Program" on the Mac, or "Modular Cleaning Program.EXE" on Windows. To use the Modular Cleaning Program, the conservator needs to make the necessary concentrated stock solutions. The recipes can be found in the database, either listed individually for each concentrated solution in the "solutions" database, or for the entire solution set in the "solution sets" database, both of which are accessed from within the Modular Cleaning Program. Labels can be printed from either the "solutions" or the "solution sets" database. The image below shows the concentrated stock solutions of citrate at pHs ranging from 5.5 to 9.5. After having mixed the concentrated stock solutions, test cleaning an artwork consists of mixing small batches of test cleaning solutions. One mL of water is mixed with one mL of buffer concentrated stock solution (at the desired pH) and optionally with one mL each of: a surfactant concentrated stock solution; a chelator concentrated stock solution (matching the pH of the buffer solution); or a gel base concentrated stock solution (which is very difficult to disperse into the test solution, but time and stirring works wonders). Any of the optional concentrates should be replaced with water in the test solution if they are not used. 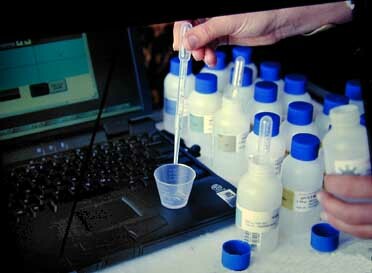 The total test solution should be 5 mL regardless of what is in the solution. For example, to make a pH 7.5 test solution with Brij 700 and citrate: Take 1 mL distilled water, 1 mL of pH 7.5 concentrated buffer solution, 1 mL of Brij 700 concentrate, 1 mL of pH 7.5 concentrated citrate solution, and 1 additional mL of distilled water, for a total of 5 mL. To measure the concentrated stock solutions accurately and quickly, use disposable polyethylene droppers (see illustration below, and please reuse the droppers). Use one dropper for water, one for the buffer solutions, one for each chelator set (separate droppers for citrate and EDTA), and one for each different surfactant solution. The test cleaning solution is mixed into a small, disposable polyethylene "weighing cup". By numbering the weighting cups, the conservator can go back to previous test solutions for comparison during the testing process. The Modular Cleaning System is for professional conservators only. It is made available at no charge to the conservation community. It is not supported -- there is no technical support. As the program is updated, registered users will receive information about updates, improvements and new features.